Since 1992, SoundSorb has been installed in transportation noise projects around the world. From Down Under to the Great Northwest, Puerto Rico to Hong Kong, SoundSorb is making life a little quieter for everyone. Please take a moment to view the variety of highway projects featuring this unique and sustainable material. Some of the quietest railway projects world-wide utilize SoundSorb to provide significant railway noise abatement, like the Taipei Rapid Transit System in Taiwan and the West Rail Project in Hong Kong. Environmental engineers working on high profile design build projects discovered long ago that by incorporating SoundSorb into their railway projects along the track bed and along the parapets, they could provide the surrounding communities with the highest quality noise mitigation to protect their living environment and residential property investment for the long term. SoundSorb is light weight, no maintenance, cost effective and provides an easy installation solution for sustainable noise mitigation. Noise abatement project savings have been realized, thanks to Soundsorb acoustical tiles, which can be retrofitted onto existing reflective walls. This method of application saves the cost of removing existing walls, while providing the community with an environmentally sensitive noise solution. Who says walls that hide equipment have to be made out of concrete blocks? Not CSI! Even commercial and industrial equipment enclosures can benefit from versatile SoundSorb. This vesatile, sound-absorbing treatment can be cast into panels or adhered to exisiting walls around noisy machinery. More and more noise abatement projects specify an aesthetic component - a particular look of stone or brick, more than one color of stain, or even murals. Because SoundSorb is free flowing, it's the perfect noise abatement material for these custom designs. Specific NRC and durability ratings can also be achieved with its use. CSI collaborates with acoustical and environmental design engineers to provide the most cost-effective and environmentally sensitive solution for use on transportation noise mitigation projects, to include excellent aesthetics and sustainability. Please explore our site and you will understand why we're so proud of our work. Why are we different? We can customize SoundSorb® to meet and exceed the noise mitigation specifications for HSR, elevated rail, light rail and all highway and industrial noise abatement projects. Our focus is on providing the most cost-effective sustainable solution to the transportation industry worldwide. 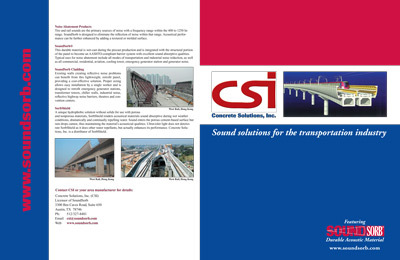 CSI licenses qualified concrete precast companies nearest the transportation project's location to manufacturer SoundSorb® according to the noise mitigation specification. CSI works with communities, design engineers, and architectural engineers to design an aesthetic noise-abatement solution suited to the local environment. Qualified concrete precast companies interested in bidding transportation noise mitigation construction projects should contact CSI (see "Application" under the Licensing tab) for details.